Writer-director Carol Morley (The Falling) adapts Martin Amis's novel Night Train, turning it into an atmospheric, dreamlike neo-noir. The characters are almost swallowed up by the woozy New Orleans backdrop, as they try to make sense of the death of astrophysicist Jennifer Rockwell (Mamie Gummer), who spent her life searching for dark matter. Morley appears to be on a quest of her own, experimenting with form and the hardboiled detective archetype by leaning into the surreal. 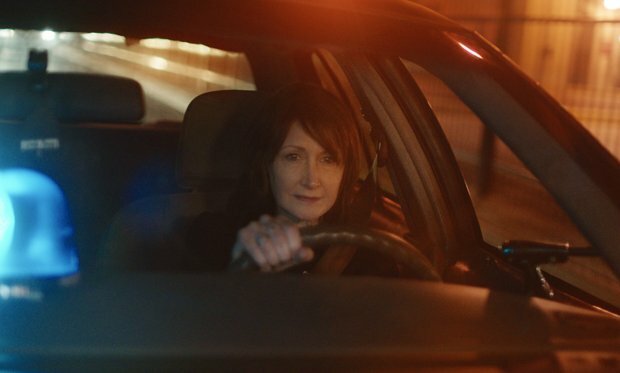 Patricia Clarkson stars as the alcoholic, world-weary detective Mike Hoolihan. She plays her with sincerity: growling out her lines, disappearing behind her paperwork, alluding to double lives and working her way through cold cases involving Hitchcockian blondes. When she's brought in to investigate Rockwell's apparent murder, her sorrow for the smart young woman stolen away in her prime is compelling, but the surrounding narrative doesn't match up. The film drops clues and unsubtle metaphors for the audience to unpick, yet none of it is as profound as it is presumably meant to be. Is Morley parodying the genre? The tone occasionally suggests that she is but the humour rarely lands, nor does the chatter about Schrodinger's cat and black holes seem much more than window dressing. Though Out of Blue has ambition, it's not strange enough to continually beguile and doesn't leave its protagonist's discoveries open to interpretation. The Lynchian vibe occasionally pulls you into its dazzling stream – think Twin Peaks with the coffee and cherry pie replaced by burritos and whiskey – and supporting actors like Gummer, Jacki Weaver, Toby Jones and Devyn A Tyler have a ball with nonsense lines. Yet it's often familiar and even a little bit naff, while the conclusion is as stale as the dusty interior of an old-fashioned dive bar. Screening on Wed 27 and Thu 28 Feb as part of the Glasgow Film Festival 2019. Selected release from Fri 29 Mar.